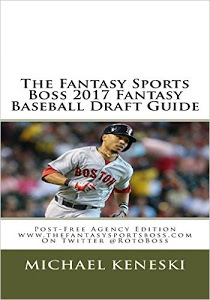 We have gotten the most e-mails recently concerning the topic of "who is the number 1 third baseman for 2017 fantasy baseball? While Manny Machado and Josh Donaldson have their cases, Kris Bryant and Nolan Arenado are slightly ahead of them both. Bryant and Arenado are slam dunk mid-first round picks in this peanut stands opinion but there are divergent arguments about who is ahead of the other. With that said, let's see who should in fact go ahead of the other by comparing Bryant and Arenado in the five standard ROTO categories. AVERAGE: This one is a wash as Arenado batted .294 to Bryant's .292 last season. What is interesting to note is that Bryant has gotten better in the average department as he lessened his K//9 rate from 2015's 30 percent to 22 a year ago. Meanwhile Arenado is pretty firm as a .285-.295 guy. STOLEN BASES: While neither guy can be considered a burner, Bryant has the speed to swipe 10 or so bags while Arenado is lucky if he gets 5. Over the last two years, Bryant has a total of 21 steals to just 4 for Arenado. HOME RUNS: Arenado is on the short list as the best pure power hitter in the game today as he now has back-to-back 40 home run seasons. Bryant got to 39 last season and hints at more to come but for now Arenado with the oh so very slight nod. RBI: This one is no contest as Arenado has gone for an insane 130 and 133 RBI the last two years while Bryant's career-best was the 102 he had last season. RUNS: Bryant outscored Arenado 121-116 last season and he has the higher OBP (.385 to .262) which helps the Cubs star get the slight nod. So as we always do when there is a tie, we go to intangibles. INTANGIBLES: Bryant is a year younger at the age of 25 to Arenado's 26 but the key issue is that the former still is showing improvement while the Rockies star has settled into his numbers the last two years. Yes Arenado's numbers are insanely good but Bryant could make a run at 50 home runs this season which would then pass Arenado's baseline of 40. Also Bryant runs quite a bit more than Arenado which is the one number where there is a sizable separation. This gives Bryant the nod in our opinion. Consider yourself lucky if you end up with either Bryant or Arenado but when the chips are on the table, go with the ascending Cubs star.